Many of us are now familiar with Calum Colvin’s remarkable series of works derived from James Macpherson’s prose poem ‘Ossian’, which was first published in the 1760s. Colvin’s work was shown at the Scottish National Portrait Gallery in 2002 and in a number of other venues across Scotland since then. However there is nothing like seeing the same work in another country to open up new perspectives on it. This was very much the case in November last year when Colvin’s exhibition Ossian: Fragments of Ancient Poetry was shown at the UNESCO headquarters in Paris. The particular space chosen for the display had the advantage of allowing the entire sequence of Colvin’s work to be shown uninterrupted, enabling the viewer to appreciate fully his thought-provoking transformations of an image of Ossian by the 18th century artist Alexander Runciman. But my purpose here is not to review Colvin’s work, because that has already been done, but rather to draw attention to its effectiveness as a focus for international academic debate. The exhibition was accompanied by a fascinating conference entitled Ossian then and now, organised by the Université Paris 7, UNESCO, the National Galleries of Scotland and Highland Council. It consisted of a number of intriguing reassessments of ‘Ossian’. Every contribution had a keynote quality, whether it was Howard Gaskill reflecting on ‘The Homer of the North’; or David Hewitt clarifying the associations between Macpherson, Scott and Byron; or Tom Normand exploring the nature of memory and imagery; or Colvin himself in discussion about his work with Duncan Macmillan. It was Macmillan’s research that brought Runciman’s art back to prominence, so his interaction with Colvin in this context could not have been more appropriate. This underlined something very important to the entire event, namely the absolute contemporary relevance of the issues around Macpherson’s ‘Ossian’. These issues of cultural loss and fragmentation were brought into sharp relief by the poet Angus Peter Campbell, who pointed out the irony of the Gaelic-speaking Macpherson electing to write in English, and the route of Anglicisation of Gaelic culture to which this led. I hope that the ill-judged exhibition of Landseer’s work at the National Gallery of Scotland last year will be one of the last examples of this trend. 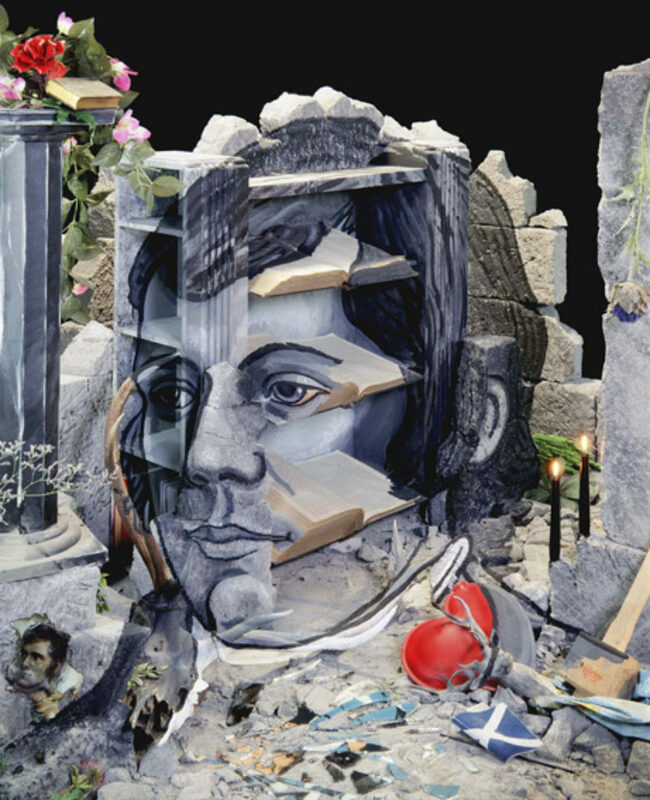 Campbell argued for the alternate view of Macpherson’s older contemporary, the Gaelic poet Alastair MacMhaighstir Alasdair, and underpinned his paper with readings in Gaelic and English from his own work. This contribution was the key to the day: it brought both illumination and critique to every other contribution, including my own exploration of the development of Highland imagery in terms of Macpherson and Burns rather than of Scott. The day concluded with a visit to the exhibition itself, in which Colvin had included a new work based on an equestrian portrait of Napoleon by Jacques Louis David, the point being that Ossian was one of Napoleon’s favourite authors, and Macpherson’s words were the inspiration of many of the great artists of the Napoleonic period, including David’s students Girodet, Gerard and Ingres. As good fortune would have it, at the time of our Ossian conference there was a wonderfully designed exhibition of Girodet’s work at the Louvre. One of the key exhibits was ‘Ossian Receiving the Generals of the Republic’. What better context could we have asked for? Where in the world do art and science meet?